Why are they avoiding showing Arys Oakheart's face? Game of Thrones edited out a lot of characters/stories from books like Lady Stoneheart (which is discussed here) and even shortened the stories of a few characters like Cold Hands (which is further discussed here). And same the happened to many Dorne characters and story arcs. 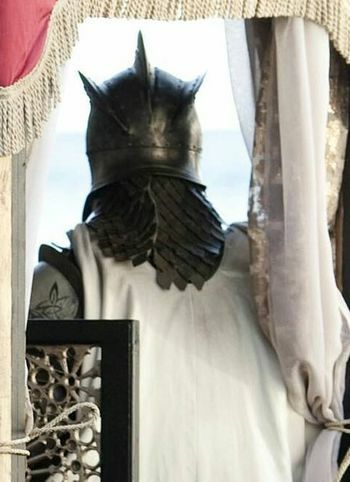 But one character who had a significant story in the Dorne arc in the book did appear but is never called by that name and didn't even show his face. he didn't even show his face. What was the reason for not showing his face? Did they even cast anyone for that role or was it always played by some random extra? I compared the Arys_Oakheart GOT Fandom page, which indicates which episodes the character appeared in with imdb.com's data. I wasn't able to find the GOT character Arys Oakheart listed in the film credits for any featured episode or the primary list of the imdb.com's GOT Full Cast & Crew . It stands to reason that if they had cast an actor to this part, the contract would have included listing that actor in the cast. Since they appear to have "no one" playing the part, you have a valid assumption that the part is played by random "extras". Not the answer you're looking for? Browse other questions tagged character production game-of-thrones casting . Why was the character Coldhands not introduced in Season 4, when he was in the books? Is Lady Stoneheart's absence from the show explained? Why did they call Harvey a two face even before the accident? Why are some actors uncredited in certain films? Why are there three different actors playing Gregor Clegane? Why doesn't the background scenery match with the face? Is the Waif wearing Arya's face? Do the Faceless Men take more than just a face? Why are superhero movies signed by actors in three-parts? Why is Childress' face scarred? Why did Tom Riddle's face become hideous?